According to news received from Mr. Omidi’s family Hamed Omidi, has been sentenced to 3 years of imprisonment by Branch 28 of the Revolutionary Court in Tehran. Mr. Omidi’s family received this news yesterday through a telephone call from Hamed. Mr. Omidi has been in pre-trial custody for the past 160 days. Sakine Mohammadi is a 43 years old Iranian woman who was sentenced to being stoned to death by the Islamic Regime in Iran for having an “illicit” relationship. Ms. Sakine Mohammadi has had to endure the punishment of flogging (99 lashes) and has been in prison for the past five years. Due to wide scale international pressure the Islamic Regime ambassador in London issued a statement denying the fact that Ms. Mohammadi- Ashtiani will be stoned to death; however Ms. Mohammadi is still in prison and at risk of imminent execution. There has been a call by International Committee Against Stoning and International Committee Against Executions to declare July 24th International Sakine Mohammadi Ashtiani Day, and take to the streets where ever we are at 2:00pm to voice our support for Ms. Mohammadi Ashtiani and to voice our abhorrence against the barbaric practice of stoning used by the Islamic Regime. There will be protest in front of the Canadian Parliament in Ottawa from 12:00pm-3pm on Saturday July 24th 2010 which I will be attending, however I think it is crucial to keep a few things in mind. 1. For every Sakine Mohammadi Ashtiani that we know about there are tens that we don’t know about who may be secretly executed or stoned to death at any moment. 2. For every political prisoner we know about who is currently facing execution there are tens or maybe hundreds that we do not know about and will never find out about. 3. Focusing on one person or one case at a time is never enough for above stated reasons and it is crucial to focus on the cause of the problem, the root which is the Islamic Regime. 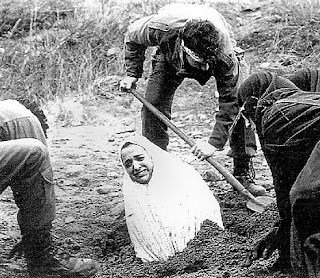 There is only one way to make sure no woman in Iran will ever be stoned again, no political prisoner will be raped or tortured or executed, and that the law will be used to protect the people rather than to oppress them. The only way is Regime Change. 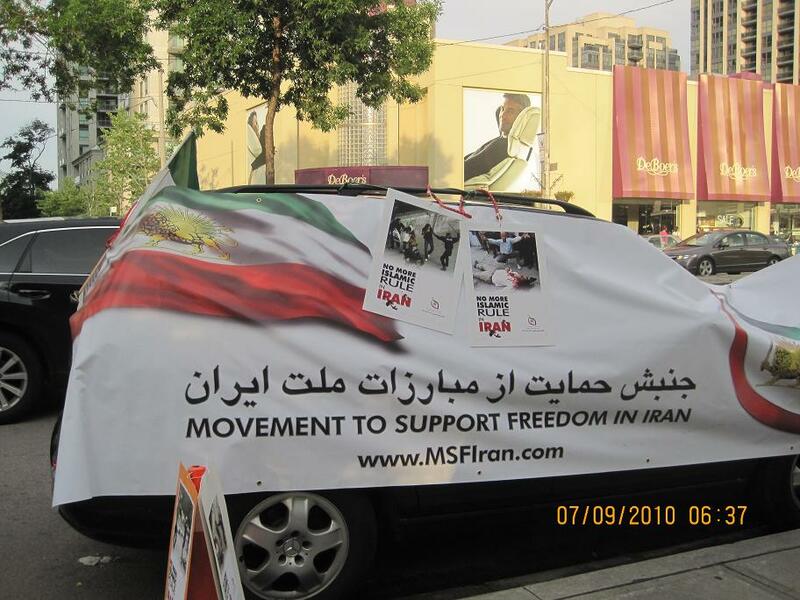 So while I will be participating in the protest to bring awareness about Ms. Mohammadi Ashtiani’s situation as well as to shed light on the issue of stoning in Iran, I will also keep in mind the fact that there are many Ms. Mohammadi Ashtiani’s in Iran and the only way to help them all is to focus on total and complete Regime Change in Iran. I hope everyone else will keep this in mind as well. After more than a week the strike of the merchants in Tehran continues, and has spread to other cities as well. While the merchants (Bazaari’s) have traditionally always supported the Regime, their strike will (even if inadvertently) support the pro-democracy movement in Iran, as the Bazaar has always been a key economical factor in Iran. Below is my translation of various news reports about the strike of the Grand Bazaar in Tehran as well as in other cities. According to Iran Press News, the strike of merchants in the Bazaar in Tabriz continued today. It must be noted that the Regime has tried to scare the merchants into breaking their strike by threatening to attack their homes and families, however so far these threats have had the opposite effect and the strike continues, with the support of many ordinary people. Today the stores in the small city of “Valiasr” close to Tabriz was also closed in solidarity with the Tabriz merchants. Today the merchants in the Grand Bazaar in Tehran continued their strike which started last Monday in response to the proposed tax increase by the government. Last week the merchants were attacked by security forces and Basij, and a well known merchant was stabbed and later on died in the hospital. Although the Regime has backed down and has announced a tax decrease, there doesn’t seem to be an end to the strike of the merchants in the Grand Bazaar in Iran. There are also reports that the strike of the merchants has spread to number of other cities including Esfehan, Mashad, Kermanshah, Hamedan and numerous cities in the Kurdistan of Iran. According to news reports from “Human Rights and Democracy Activists in Iran” Behrouz Javid Tehrani has been finally transferred to the common ward in Section 1 of the Gohardasht prison, after spending 53 days in solitary confinement and being subjected to brutal torture. While in solitary confinement Mr. Tehrani went on a hunger strike in order to defend his own rights and the rights of other political prisoners. Even under the worst conditions imaginable Mr. Tehrani has never given up his fight for freedom and democracy. Today pro-democracy activists gathered in the Mel-Lastman Square in Toronto to commemorate the 11th anniversary of the July 9th (18 Tir) 1999 pro-democracy demonstrations. The July 9th 1999 protests were the first large scale pro-democracy protests since the Islamic Regime had come to power and have become a source of inspiration for activists both inside and outside of Iran. A student activist Ebrahim Ezat Nejad was shot to death during the protests, while a student leader Akbar Mohammadi was killed by the Islamic Regime agents in the notorious Evin Prison in August of 2006, while serving a 15 year jail sentence for his participation in the protests. Behrouz Javid Tehrani another well known pro-democracy student activist is still in prison 11 years after the 18 Tir protests because of his pro-democracy activities. Tonight we remember Ebrahim Ezat Nejad and Akbar Mohammadi, while keeping Behrouz Javid Tehrani in our thoughts and prayers. We also remember those who have lost their lives in the past 31 years for a free and democratic Iran. Although the merchants have gone on a strike because of raised taxes rather than a purely political motive, if the strike does continue it is likely that it will have a crippling effect on the Regime and will inadvertently help the pro-demcracy movement in Iran. According to various news reports from Iran Press News the merchants in the Tehran Market (Bazaar) are on their third (3rd) day of strike. The merchants started their strike in response to the increase in taxes and have continued the strike after a merchant was stabbed and died in the hospital by security forces yesterday afternoon. According to these news reports between 80-100 merchants gathered in the area of “Sabzeh Meydan” and chanted slogans such as “death to dictator and death to this misleading government.” A number of young students also joined the protests. The protestors were surrounded by security forces and it looked like the security forces may attack the protestors at any moment. At around 1:30pm most of the stores in the main sections of the Bazaar including gold/jewelry stores, fabric stores, carpet stores and stores selling bulk goods were closed. The news of the strike of the Tehran Merchants is spreading to cities around Tehran and there is a possibility that they may join the strike. The merchants going on a strike is very exciting news, as they are generally supporters of Regime and have not been known for going on strikes or showing solidarity with the Iranian people. I think the fact that merchants are going on strike can be seen as a sign of Regime losing some of its most faithful supporters. I am very optimistic about this and will be following the developments closely in the next few weeks. According to various news reports from Iran Press News this morning a large number of merchants, including those selling gold and cloth did not open their stores in protest against the increase in taxes by the Islamic Regime. The strike which had started yesterday July 6th continued today. 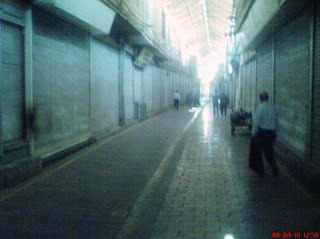 Only few stores were open on the street of gold merchants and the presence of security forces was strong in the Bazaar. It must be noted that this is a very important development as the Bazaar has traditionally supported the Regime, and even last year after the presidential [s]elections when millions of people protested and many were murdered by Regime Agents, the merchants did not react and did not strike. According to other news reports from Iran Press News, the merchants in the city of Esfehan who wanted to go on strike in solidarity with the Tehran merchants have been threatened by the security forces. The Regime fears a strike by the merchants as the Bazaar is a very important economical factor in Iran. At 3:00pm Tehran time the security forces attacked some of the closed stores including number of stores that sell cloth and cause a great deal of economic damage to the stores. There have also been reports of serious physical altercations between the security forces and the merchants, where many merchants have been arrested, and a well known merchant Haj Kashani was stabbed by security forces and died later on in the hospital. The security forces have also fired tear gas at the merchants who are reportedly fighting back physically and chanting anti-Regime slogans. All paths to the Bazaar has been closed by the security forces and even the subways are not stopping at the Bazaar station. Number of well known merchants have announced that tomorrow Thursday July 8th will be a day of general strike by the merchants in protest against the attack of security forces and the murder of Haj Kashani. We are fast approaching July 9th which marks the 11th year anniversary of the July 9th (18 Tir) 1999 pro-democracy student demonstration in Iran. The 18 Tir demonstrations were originally triggered when a reformist newspaper “Salam” was banned from publication. As a reaction to the peaceful protests Regime Agents attacked the student dormitories in Tehran University where they beat and arrested hundreds of students and turned the dormitories into a blood bath. At least one student was murdered by Regime Agents when he was thrown off the dormitory balcony. The students reacted to this brutal attack to the dormitories by organizing mass pro-democracy protests which quickly took a radical turn towards Regime change and away from reform. Thousands of ordinary freedom loving Iranians joined the students on the streets for the next five days, when Iran saw the largest pro-democracy demonstrations since the Revolution in 1979. Quickly it became very clear that the movement had nothing to do with reform and was about Regime change and democracy in Iran. Thousands of students were arrested and charged with, among other things “risking national security.” Akbar Mohammadi was one of the students who was arrested and sentenced to death for his involvement in the peaceful demonstrations. Due to overwhelming international pressure his sentence was eventually reduced to 15 years of imprisonment. Unfortunately Akbar Mohammadi died under very suspicious circumstances on August 2nd 2006, in the notorious Evin Prison while he was on a hunger strike. It is widely believed that he was murdered by the Regime Agents because throughout 7 years of imprisonment and the most brutal torture imaginable he refused to back down and refused to cooperate with the Regime in anyway. The 18 Tir pro-democracy demonstrations has been perhaps one of the only significant pro-democracy events in the past 31 years that has not been tainted by the concept of reform, and has always been about democracy and Regime Change. It is therefore extremely unfortunate and even opportunistic on part of some of the Toronto “activists” who have taken upon themselves to organize an event inviting a very well known reformist Mashallah Abbas-Zadeh in a desperate attempt to link the 18 Tir pro-democracy demonstrations to the reformist movement. Having said that, as hard as these individuals might try, they will not be successful, because 18 Tir movement was a movement with a pure yet strong intention. 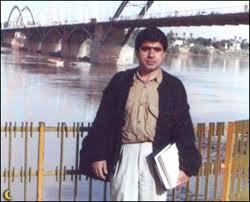 Akbar Mohammadi sacrificed his life in order to pave the way for a democratic Iran. Behrouz Tehrani sacrificed his youth in order to pave the way for a democratic Iran. It would have been very easy for either one of these individuals to cooperate with the Regime as many well known “student leaders” have done, and live a comfortable life in Los Angeles or Washington, however the path for a democratic Iran is paved with people like Akbar and Behrouz and thousands of other freedom loving Iranians who will not compromise their beliefs and ideas for money or fame or anything else. That is the reason why these “activists” in Toronto or anywhere else will never be successful in tainting this strong and historic pro-democracy movement. I condemn any opportunistic attempt by certain “activists” in Toronto to use this historic day to further their pro-reformist agenda. In memory of Akbar Mohammadi and all other freedom loving Iranians who have sacrificed their lives for a free and democratic Iran. Over the past 17 years I have come to call Canada my home. My family and I have been able to have a new beginning in Canada, away from the tyranny and oppression of the Islamic Regime in Iran. I’ve come to realize that Canada is a country that provides numerous opportunities, as long as you are willing to work hard and take advantage of them. Canada has given me the opportunity to complete a BA, graduate from law school and become a successful defence lawyer, while at the same time allowing me to stay true to my beliefs and ideas, allowing me to actively pursue my cause which is democracy and Regime change in Iran. I am so grateful to be living in this country where I can speak my mind and not have to worry about Regime Agents kidnapping me in the middle of the night and taking me to unknown locations. I have no doubt that if I had stayed in Iran, today I would either be in prison or dead, and so I am even more grateful for the amazing life that I have in Canada. I wish everyone a very happy Canada Day.